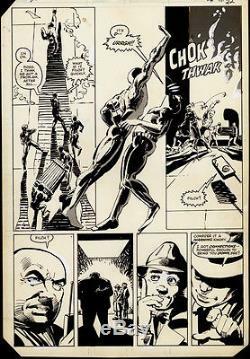 Action page from the ground breaking Miller / Janson CLASSIC MARVEL Comics run. First issue penciled and inked SOLELY by Klaus Janson. 10 x 15 on Bristol. Corners are trimmed (shown on image) as per. Marvel practices at that time. Frank Miller drew tight breakdowns on a separate sheet not. That Janson adapted into this finished piece of Bristol. This DAREDEVIL page has not been up for sale for over 25 years. Minor use of white for FX. 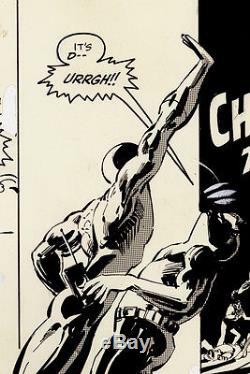 Minimal use of screen tone on the dynamic central figure of Daredevil in action and smoke effect on third panel that are very flat, clean and secure on the art. The composition on this page is like a masterclass in comic book storytelling and technique. 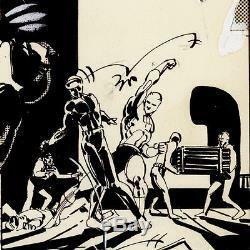 Silhouettes, Central focal point, Characters in a variety of scale, mood and multiple figures in a medium sized action panel. The item "DAREDEVIL #185 Klaus Janson Original Art, Frank Miller story" is in sale since Thursday, November 24, 2016. This item is in the category "Collectibles\Comics\Original Comic Art\Interior Pages". The seller is "user-friendly" and is located in New York, New York. This item can be shipped worldwide.